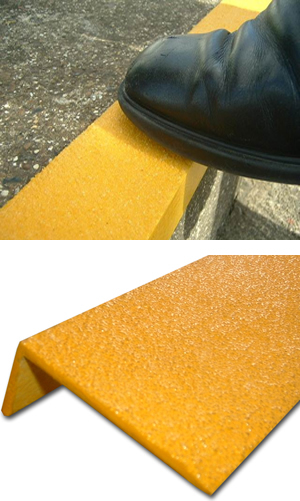 TreadSafe® GRP safety edgings are manufactured from 3mm thick GRP with a feathered edge to prevent a trip hazard. They provide a cost-effective, long-term solution to the obligations under the Disability Discrimination Act Part 111 with regard to the sections relevant to the partially sighted. Available in a choice of abrasive grit sizes, they are suitable for internal or external applications. Standard sizes are 70 x 30mm nosing and 55 x 55mm nosing in lengths of 3020mm, 150mm and 750mm. Colour choices include yellow or white. A photo-luminescent option is also available.